This longline bra by Christian Dior is an iconic 1950s lingerie piece, combining both luxurious design with the defining pointed bust line of the era. The ready-to-wear lingerie collections of the late 1950s saw signature design elements such as luxurious laces, lattices of velvet ribbon and velvet linings. Colourways were either white with sugar pink trimming or plain black. The collections were extremely high end: the combination of difficult construction and design, French-sourced materials and limited market meant that stock was limited and prices were high. Nevertheless, the collection was a great success. A corselet from the collections was advertised in 1959 as costing £7.19s.6d, approximately £170 in 2016. The bra is neatly machine constructed in a mix of rigid nylon mesh, leavers lace and stretch net. It has a longline shape with a subtly pointed bust silhouette. The cups are made of a 3-piece pattern, with a stiffened lining to the side sling and a scalloped shape stiffened support inside the bottom cup, caught between the outer lace and nylon mesh lining. The bra uses almost entirely black fabric, with a white mesh used as lining in the cup side sling and side cradle, offering a contrast to the design of the outer lace. The cradle and wings are mostly made of rigid mesh and lace, with with small triangular inserts of stretch mesh and a small panel of stretch mesh to the back left of the hook fastening to offer fit flexibility. The centre front of the bra cradle is a double layered piece of sheer nylon mesh, overlayed with decorative velvet ribbon lattice, with a keyhole cutout between the cups and centre cradle. The bra is constructed entirely with machine stitching, with seams either neatly enclosed with linings or taped over with nylon satin seams or lace trims. Satin ribbon channels at the sides of each cup enclose spiral steel bones for structure and maintaining vertical tension. The garment is constructed almost entirely with lockstitch, with a small area of zigzag hemming the stretch mesh panels. The garment fastens with hooks and eyes at the centre back, with the eye section featuring a luxurious velvet lining. Shoulder straps are constructed of twin needled nylon channels, with enamelled metal adjusters at each cup apex. At some point in its life, the bra has been neatly altered by hand, taking in the bra wings on either side by around 4cm on either side. The bra has two labels sewn into the hook tape. 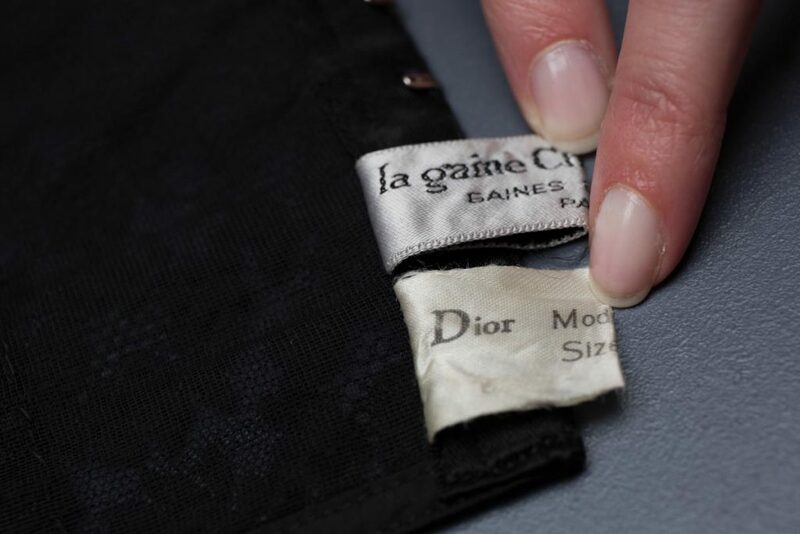 One features the brand name, stating ‘la gaine Christian Dior/GAINES GORGES/PARIS’. 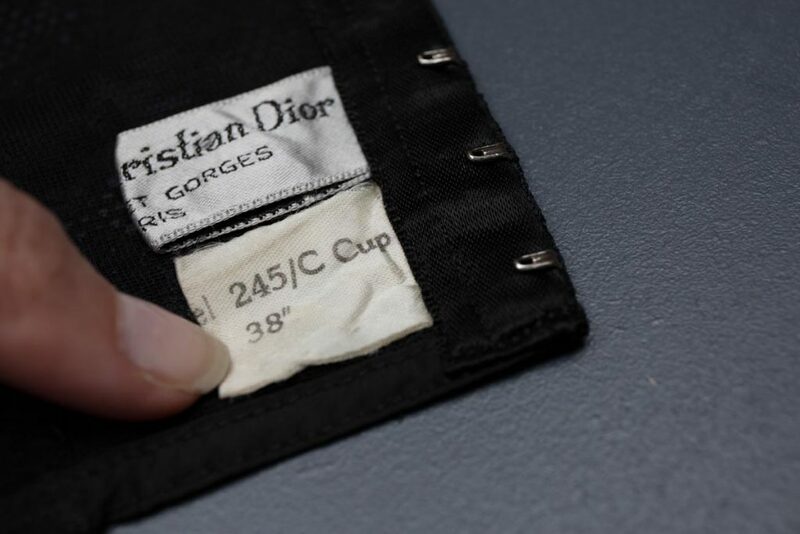 The other has the size and model information: ‘Dior Model 245 C Cup/38″‘. The measurement in inches likely referred to the bra’s overbust measurement, unlikely modern bras that pair the cup size with an underbust size. 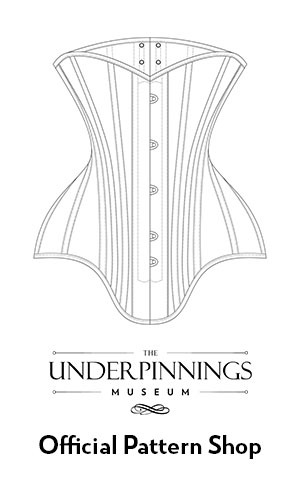 From the collection of The Underpinnings Museum. Kindly subsidised by Cult Of Chiffon.